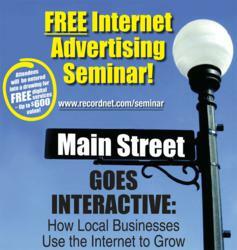 “Main Street Goes Interactive: How Local Businesses Use the Internet to Grow” is a new seminar series from Recordnet.com and The Record. Attendees are sure to walk away with the knowledge and tools needed to enhance or create their digital presence in this rapidly changing environment. “Main Street Goes Interactive: How Local Businesses Use the Internet to Grow” is a new seminar series from Recordnet.com and The Record. At the six, one-hour seminars, Stockton-area businesses will learn how other businesses in their industry invest in promoting their company online. The six seminars available will cover developing a website, leveraging social media for your business, search engine marketing and the rest of the latest in internet marketing strategy, including San Joaquin Media Group’s new deals product, LimelightDeals.com. The seminars will all be held at The Record. Gregory Thompson, regional digital manager for Dow Jones Local Media Group, will share digital marketing knowledge and techniques with local businesses. Thompson has extensive research and can share tactics which businesses can apply immediately to help acquire new customers, grow market share and gain the competitive edge needed in today’s busy and aggressive digital world. Sessions will be held 3 times per day on both January 26/27 at The Record offices (530 East Market Street) in Stockton. Content will be specifically tailored to particular business category needs. Retail, Real Estate, Automotive, Professional/Services. Parking is available in the parking garage immediately to the west of the offices. Validation is available. Local businesses interested in registering for the seminar can visit http://www.recordnet.com/seminar. Space is limited, so reservation is strongly recommended. Dow Jones Local Media Group (http://www.dowjoneslmg.com), operates eight community media groups around the country – including San Joaquin Media Group – that collectively are comprised of 8 daily and 15 weekly newspapers, several lifestyle magazines and other niche publications, and a multitude of affiliated Web sites in seven states.